This is a completely unbiased Chilipad review and I have tried to list down everything that can help you with your purchase. While the summer season is full of life, it is the nights that take a toll on us. Yes, the moon sets in for a smaller time, but the few hours of zzz’s that one expects end up turning into a hot, sticky turmoil. Similarly, when the northern winds make their way during the winter season, your bed ends up becoming nothing less than an ice-zone. How about having something which can strike a balance amidst such rough nights? Imagine something that can give you absolute control over how warm or cool your bed can be. That’s exactly what a ChiliPad cube does. This electric cooling mattress pad uses a series of micro-tubes that allow water flow to help control temperature. So all you got to do is place the pad in between the mattress and the sheets and get your desired temperature instantly. With this basic understanding, let’s move forward to its construction and answer all other why and how’s. Basically the brain behind Chilipad is the cube itself. Since the pad uses water for the temperature control, this cube is responsible for cooling or warming up the water that goes in the bed cooling pad. The cube, being small in size (approximately 9x9x7 inches) can be easily placed anywhere without diverting much attention to itself. However, the cube has got little vents and pipes running out of it due to which it requires some room for itself. Hence, you can’t really place it in tight places like under the bed or behind it. The idea of having tubes run through the pad seems discomforting but to everyone’s surprise, you won’t feel a thing. In fact, the material and overall feel of the pad is thin, soft and light-weighted. The cover is made out of quilted, 150-thread count, poly-cotton blend and comes with straps at each corner so that the pad doesn’t slip off. Secondly, the tubes that run through the mattress pad are fully secured in silicon cover, underneath the padding itself, which makes it 100% leak proof. All in all, once you lay down on this electric cooling pad for bed and cover it with your normal bed sheets you won’t feel much difference but in fact would enjoy the extra comfort. The tubes are really hard to ignore and are the crux of this whole design. Since they are attached to the cube and end up to the mattress pad itself, the manufacturers gave us long tubes so that it doesn’t cause any hassle. With 8 feet long tubes, you won’t have to worry about anything (or leaks in particular). The wireless remote gives you all the options you can ask for in a bed cooling system so that you won’t have to wake up in the middle of the night and go to the cube. After syncing it with the cube, you can expect complete temperature control, on/off buttons, low-water notification along with the current temperature indication. Before I begin, let me add in this tiny detail-The ChiliPad cube has a temperature range of 55 to 110 degrees Fahrenheit. This means you can take the temperature down to as low as 55 degrees F and high as 110 degrees F. Secondly, If one asks which is the better mode (i.e is the cool mode better or the warm one, I would say the cool side. I like to call it my personal bed air conditioner. Unpacking and setting the ChiliPad won’t be hard at all, since it comes with a super-easy to understand instruction manual. After connecting the tubes, you will be satisfied with the leaking part (which is one of the biggest concerns). The water goes inside the Cube and in case the water dries up or the levels go down, you will get to know on it on the wireless remote. Once you switch on the cube, you will experience a mild fan sound. By default, the ChiliPad cube will work up to 10 hours or when the set temperature has been maintained, after that it will turn off by itself. Since the cube is a little unit in itself, you might experience it adding in hot air to your room. This can be dealt with using it along with air-conditioning too. The ChiliPad will be a personal favorite of those sleepers who’s biggest pet peeve is the hot side of the bed. Overall, the product won’t disappoint you and has a few distinctive features of itself. No matter what happens, you are the boss when the ChiliPad cube is running. Imagine waking up in the middle of the night all drenched and sweaty and not being able to understand what is going on. Or worse, waking up frozen. We all have had such nights and with the ChiliPad in, you won’t ever have to worry about being un-necessarily warm ( or cold) again. All you got to do is press one button and you will immediately feel the temperature go down. Even with an air-conditioner, it takes sometime for the room to cool down. Especially when it is humid, no matter how cool the room is, the bed is still toasty. For those humid nights this heating and cooling mattress pad can do wonders. As soon as you turn it on, you will feel an immediate difference in the temperature. Although the tubes are 8 ft long, but it doesn’t take long for the cube to pump up water and voila! perfect temperature in minutes. 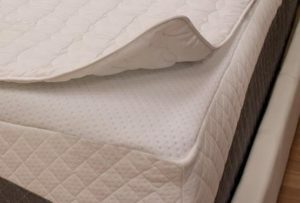 Worried that you might over-use your mattress pad? or are just overly cautious when it comes to your bedding. Then you don’t need to worry with this one. 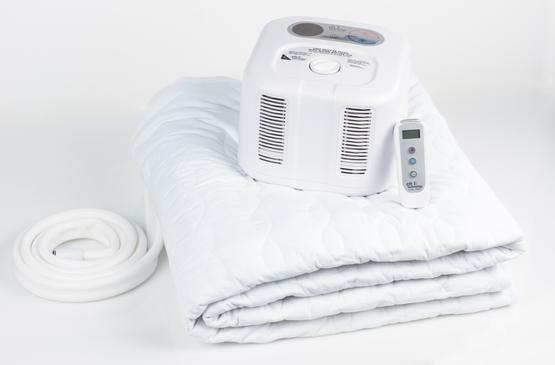 This electric mattress pad being a poly-cotton blend is completely washable and doesn’t lose its softness at all. The ChiliPad is just like another part of your bedding range and has the ability to give you the best temperature to sleep in. Probably the most amazing feature that comes in a Chilipad cube is the dual-zone temperature feature. Because everybody has their own body temperature and its not necessary for two people to find one mutual temperature on which they can agree upon, so in order to cater such couples there is a ChiliPad model which allows two different temperature sides. For instance, your partner can have their side warmer or cooler and you can have yours at a different temperature. Although these particular models fall into the expensive range, but it gives you the best of both world. Yes, the summer season is brutal and no matter what you need the air-conditioner on. So with the air-conditioner on all night, you might be thinking why do i need to bring in another unit to keep me cool? I mean, that looks heavy if you are on a tight budget. ChiliPad cube knows how to keep you cool and your budget under control. The unit is designed to be super energy efficient and turns off automatically once the desired temperature is maintained. This means that neither will the unit run all night nor would it cause you big bills. You will hear some noise come from the unit and if you keep it somewhere near your bed, it will be loud. The noise will appear to be that of a fan’s, so in case you are a light-sleeper then this might cause you a bit of trouble. But in all honesty, it isn’t something you can’t sleep with. I mean you’d love the comfort it offers and forget the little noise it makes. Never try to fit the unit under your bed or in tight small places. Yes, after turning it off and unplugging it, you can slide it under your bed or wherever you feel like, but when its working do NOT keep it in tight places. Ideally, you should give the unit at least 24 inches of space from all sides. If you have little kids then they might fall over it in the middle of the night so you got be careful about where you keep it. Although the instructional menu is clear and you will install in the tubes correctly but you will always have an irrational fear of the tubes bursting or the leaking. This case is rare in which the tubes burst or leak but then again, your mind can play anxious tricks. So if you don’t really like pipes around your bed or coming into your mattress, then don’t opt for this product at all. Not everyone can afford to buy a ChiliPad I agree. Even I myself was double-minded when I looked at the price tag. However, if you prefer good sleep and can afford to spend some money, go for it. If you’ve got a tight budget but still want a temperature control system for your bed, look at this ChiliPad alternative. People have different preferences when it comes to the ideal sleeping temperature. Some like to have a cool bed, while some can’t really sleep without being cozy. For such picky sleepers the ChiliPad cube will do wonders. Easy to use and simple to set-up, the ChiliPad doesn’t require any extravagant treatment. 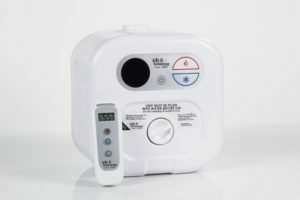 All you have to do is connect the unit and tubes, put in water and control temperature from the remote that comes with it. For people who experience joint-pains or just need a refreshing sleep after a tiresome day, the warm temperature of the ChiliPad will serve great. For those who hate the toasty bed, especially in those humid nights, the cool temperature range will aid them to the best. However, it should be noted that these pads can not be used as an alternative to either Air-conditioners or central heating unit. They provide you with the extra comfort during extreme and harsh weather conditions. But there is no denying it. A ChiliPad cube is an intelligent bedding item and acts as a heating as well as cooling mattress pad. With ChiliPad, my mattress is the coolest mattress to sleep on. Let me know if you have any questions about my review of Chilipad cube.